In answer to that question and as a nod to the 2012 Olympics on the way, we’ll be reviewing two sporty books over the next week or so. ‘The Champion Hare’ is the first. Before we start, it’s only fair to mention that we’ve got a vested interest in Gwen Christie’s book. We illustrated it! Having said that, we don’t benefit from sales of the book (unless you buy it via our own links) and we promise not to mention the ‘i’ word again. Written entirely in rhyming couplets, ‘The Champion Hare’ tells the story of the animal sports contest which is held every few years. Despite a jeering hyena doing his best to persuade him otherwise, the hare decides to take part. It shouldn’t be a spoiler (the title gives it away!) to reveal that the hare is the victor in the end. By persevering with each of the ten events, he wins the decathlon. It’s a charming tale of how a positive attitude and the desire to keep at it can bring success, sometimes without you even realising. 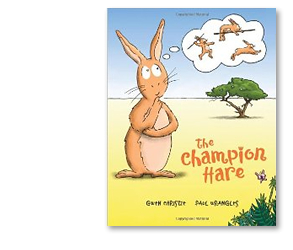 ‘The Champion Hare’ was written with KS1 (Lower Elementary) children in mind and Gwen Christie has put in a lot of time to ensure that it is well-supported by suitable KS1 classroom resources. Just visit the Champion Hare website (www.championhare.com) and go to the ‘Resources’ tab. There, you’ll be able to download a ‘Become a Champion’ motivational pack, printable number and alphabet lines and Powerpoint activities. They’re all linked to the story and they’re all completely free. The hare doesn’t win any of the events he tries. Does this make him less of a success? Is finishing first the most important thing? What if the hare hadn’t won the medal? From what you know of him, do you think he’d be disappointed? This is a well-written story suitable for KS1 children and the rhythm of the couplets ensures that your pupils will remember little snippets long after you (or they) have put the book down. Ask your pupils what sort of character a hare might be. More often than not, they’ll have him down as an over-confident, cocky individual who gets shown up by a tortoise. Aesop has got a lot to answer for. In ‘The Champion Hare’, we’re pleased to report there’s not a tortoise in sight and Gwen Christie redresses the balance for hares everywhere.